Calories - Chiller = ~200kcal. McFlurry - ~510kcal (The 'regular' was 700kcal!). Read the review to see the rating! My mother, sister and I made our way to the to Great Lakes Crossing Outlet mall across the bridge in Michigan to buy me some clothes (clothes are ~35-40% cheaper in the states to begin with, and buying them at the outlet adds to the savings, also, I am not a Canadian resident so I can buy as much without paying duty as I want because its not staying in Canada). After the hour long drive my sister was hungry, and we walked across the street to the McDonald's so I could try their new US snack items. We tried the heavily promoted 'Cherry Berry Chiller', which apparently is different to the 'Wild Berry Smoothie' as the Chiller is 'regular' McDonald's and the Smoothie is part of the McCafe menu. I only had a sip of the Chiller, but I did have a few bites of the McFlurry before passing it on to my sister to finish off. 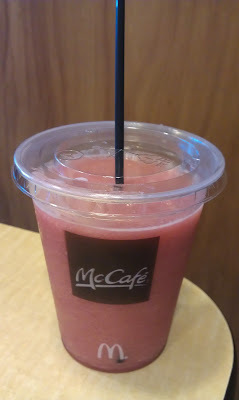 The chiller tasted highly artificial, and was served in a McCafe plastic cup rather than a paper cup. It was cold and had a pretty good mix of ice to flavouring, but it tasted exactly as you think artificial cherry should taste like. The saving grace of this snack was the Rolo McFlurry, now I don't think this is a limited time item in the US (I could be wrong, leave a comment if I am), but it was pretty good, though the 'snack' size is equivalent to the regular size in the rest of the world, I would be scared to see what the 700kcal 'regular' size would be like. 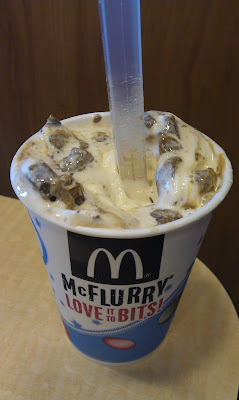 They had massive pieces of chocolate Rolo pieces on the top (even larger than the Drumstick McFlurry I had back in Canada). Though I am not usually a fan of caramel on ice cream (or caramel in much of anything for that matter), there wasn't actually all that much, so the caramel taste did not over power the chocolate. 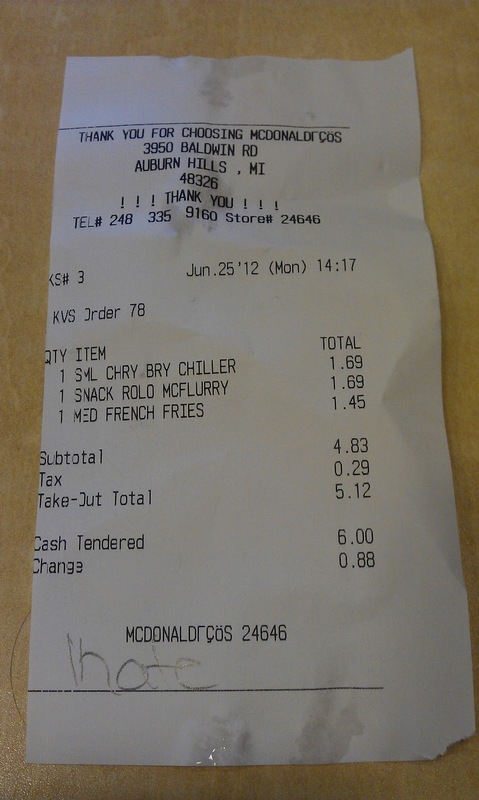 Also in its favour was the price. Where as the smaller snack-size McFlurry in Canada is 2.29+tax, the regular US pricing is only 1.69+tax for a noticeably larger cup. By the way...I don't like the practice of asking for someone's name then calling it out for the order. When they asked, I gave my sisters name 'Cate', which somehow became 'Lhate' which I am pretty sure isn't even a name in any language. K-ate? Could be a really curly K... Don't mind me, just reading your entire blog backwards.